This feast bowl imitates the shape of a Haida chief’s rattle and the same supernatural beings are shown. 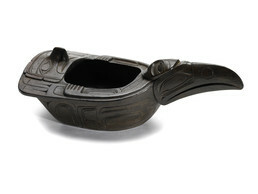 Raven’s body lends the bowl its overall form, and the cannibal spirit, Ulala, reclines on top. Ulala’s arms extend around the bowl toward Hawk, who peers from Raven’s tail feathers. Chiefly hosts served rich foods in carved bowls like this to their guests at winter ceremonies.